We had all intentions of starting out this week with a New Year clean slate, healthy attitude. Then I was slammed with a cold Monday night and all those healthy intentions went out the door. It has become a eat what you have on hand kind of week, which is not a bad thing either, as it forces me to become creative with what we have in the kitchen. 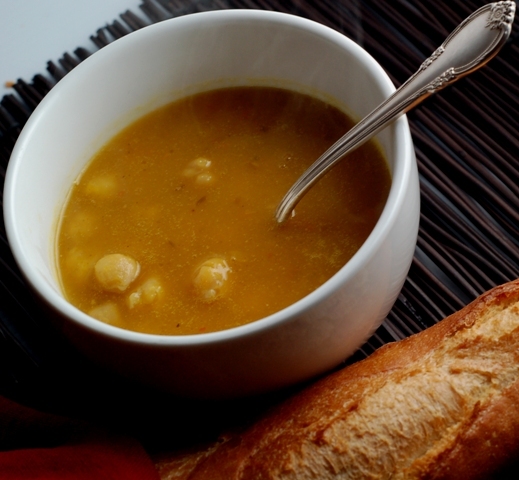 For instance, this quick throw together Pumpkin Chickpea Soup recipe which is really yummy. All I could find in our bare pantry and freezer was a couple can of chickpeas, small amounts of various grains and pasta, some frozen steaks, eggs, a small amount of frozen chicken stock and a bit of frozen leftover roasted pumpkin. I vaguely remembered a pumpkin soup in one of the magazines I have but did not feel like scouring them, so I threw together this little soup and served it with a warmed up baguette (also from the freezer). I toasted some cumin seeds with a small amount of olive oil and then added the pumpkin, chicken stock and a can of chickpeas. Gently heated through for about 30 minutes, just to blend the flavors, then seasoned with salt and pepper. Voila, dinner! I had expected to sit down, taste it and hear Lenny say this was one of the worse things we have had in a long time; but, it was actually pretty good! Could have added some shallots or onions, but otherwise, it was easy, flavorful and good. See what you can come up with limited resources! 4 Responses to "Pumpkin Chickpea Soup"
I actually think this is very enticing. I like the addition of the toasted cumin seeds for taste and aroma. Hope you feel better. We have had the same kind of week. Last night we resorted to quesadillas for dinner which hasn't happened in about six months. This was after we circled all of south Austin going "Where do you want to eat?" "I don't know, where do you want to eat? ", until I realized that my indecision meant that none of the nearby restaurants were going to make me happy and we should just go home. That soup actually does look and sound pretty good though. I would never have thought of putting chickpeas in pumpkin soup. Great idea! Maybe some greens of some kind would be good in it too.